I have never tried Yacon Syrup as an appetite suppressing before. I was really curious about the product, that's why I never hesitated to try when I have the chance to acquire one. I've been researching about what the product can benefit me. It mentions that it's a natural source of FOS [fructooligosaccharides] which is a vital source of fiber for healthy digestive balance and good probiotic function. If you are pregnant this is also safe to take, however, if you are not comfortable, it's always BEST to take the Syrup to your practitioner to make sure before taking them. The shipping and handling of the product is indeed magnificent, while I do find the size of the box way too big for a small product, still I don't know exactly the reasons behind. Nevertheless, maybe the seller just wants to ensure the safety and non-damage product to arrive in each customer. Whatever they plan, it's fine with me. There are also benefits that you can get from Yacon syrup, if you want to discover more read the back portion of the label and you'll be able to see it from there. The taste for me is fine, I would say it's the first time I have tried the product and yes, it might taste different but later on I get use to it. 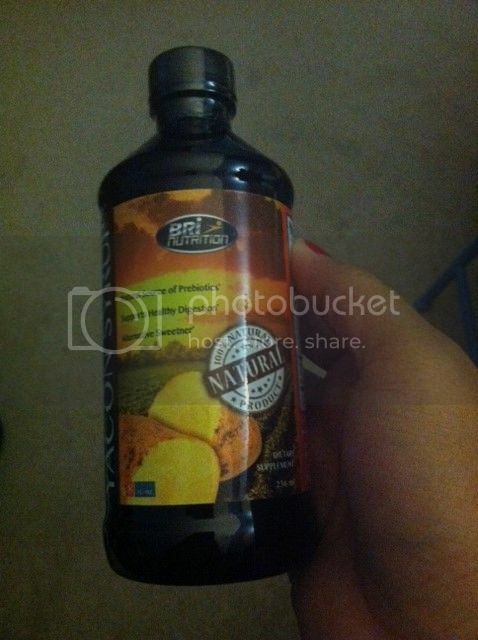 Sweeter but knowing it's 100% all natural, this dietary supplement is good for me. It might take days before I'll find out the best result, but so far, whenever I take 1 teaspoon 3x a day, I don't feel as hungry as before. Meaning, it's working as my consumption of food isn't as much as before. Like to try the safe product of this Dietary Supplement? Try Yacon Syrup and get yours now. But wait, you do have a great chance to acquire your own Yacon Syrup, simply join the giveaway here. You must be 18+ years of age and a US resident. This is my second time hearing of it. I'm getting more and more curious. I think it'd be nice to try it! Never heard of this before. Sounds like a good product but we will see with your result. Hi! This is Brendan of BRI Nutrition and I can't help but notice most of you haven't heard of our product yet. That's completely understandable, due to the fact that, many supplements overwhelm our market today and only a few offer a safe and more natural supplement like we do here at BRI Nutrition. If you'd like to know more about Yacon Syrup, please visit our product page. Yacon syrup has a very sweet taste that's not for everyone, but it has a wealth of benefits. I wouldn't mind trying out this company's Klamath Blue Green Algae, too.